The NGSS website has an incredible amount of information, but it can be quite difficult to navigate and find what you need. It is very difficult to approach the first time without any guidance, but by the end of this page you should be able to find the resources you need in a very short time. The easiest way to find the website is to type "NGSS" into any search engine. It should be the top result, but it may be lower down. Or type in www.nextgenscience.org. Once there, you'll see this splash page. 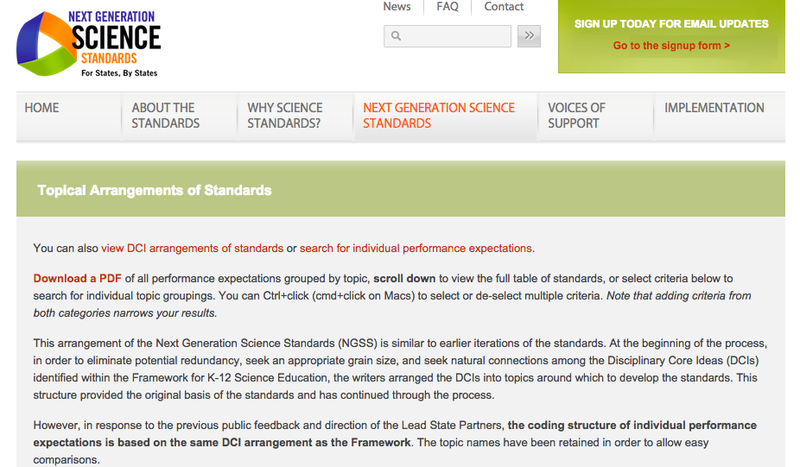 You want to click at the top where it says "NEXT GENERATION SCIENCE STANDARDS" to take you to the standards page itself. 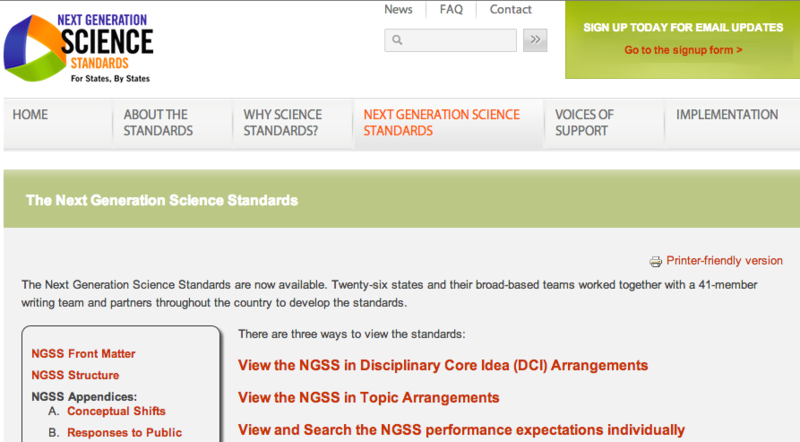 Once on this page, you have three options for viewing the NGSS. You want the middle option, Topic Arrangement. That is the easiest one to use while familiarizing yourself with the standards, but be prepared for a very unhelpful page of text when you first open the link. This is not the part of the page you care about. From here, scroll all the way down to the bottom. You will first come to a search box with some things to select or type in. Also ignore that. Down at the very, very bottom is where you will find the standards organized in a very nice way. It is divided into K-5 at the top, then two columns with 6-8 standards on the left and 9-12 standards on the right and both organized by subject: Physical, Life, and Earth/Space science. Here's where things get awesome. This is the NGSS mother lode. It helps you to see how things are laid out, and each section has a Storyline which helps show the connections between and among the different sections. For teachers who are struggling with the integrated model, the Storylines can be very helpful for seeing the vision of NGSS and the mapping out your class so that at the end of it students can tell that story in their own words. As an example, if you choose the High School (HS) Physical Science (PS) standards looking at Energy (PS-3) it will open up a page that shows the five Performance Expectations involving energy and energy interactions. At the top of the standards there are options calls "Views". Click on "Practices and Crosscutting Concepts" so that the all-black text will show the Science and Engineering practices in blue text and the Crosscutting Concepts in green text. This helps guide the three-dimensionality of each standard. This guide will focus on the fifth one of those (HS-PS-3.5) in the "Practices and Crosscutting Concepts" view. Within each Performance Expectation (the first sentence of the standards) there is embedded one SEP, one CCC, and one or more DCI. On the website they have popup menus that appear when you hover over part of the standard to clarify the details of each dimension of the PE. You can also turn off the pop-ups by clicking "Disable Popups" in the "Views" options. Below the standard is the Tiny Red Text of DOOOM, which is actually the best part of each standard. If the Performance Expectation throws you into a wide and wooly wilderness with ultimate freedom and a huge amount of information, the TRToDOOOM hands you a map with boundaries and elevation marks to help your plan your path. The Clarification Statement gives examples or suggestions for things students could do to meet the expectation, and the Assessment boundary sets limits on the topics to clearly define the depth of knowledge students must exhibit. At the bottom of the page if you keep scrolling down, there are these colored columns. You'll notice that everything is carefully color-coded here, too. Blue is for SEP, green for CCC, and orange for DCI. Paying attention to this can help you track what's happening. This is duplicate information as what is found in the popup, but with all of the pieces for all Performance Expectations in that section put together and visible even when popups are disabled (matching PEs are indicated at the end). With this basic information, you should be able to find the appropriate Storylines and standards for the grade and subject you teach and more importantly understand what information it is trying to give you.